"Heavy duty 12V portable jumpstart system, material: PP plastic, Built-in 12V 17AH sealed-lead-acid rechargable battery Heavy duty CU booster cable, 60cm length, 900A peak current, 400A starting current, Built-in 260psi air compressor pressure gauge, on/off switch & 3pcs air nozzle adaptors, 12V 3.6W working lights, one DC 12V output socket, 12V 15A with automatic circuit overload protection, automatic cut off to prevent overcharging, Voltmetre show the battery level, one charging indicator LED light, Included AC/DC charging adaptor & 12V DC power cord. Length of wire: 0.6m, 400 crank amps." 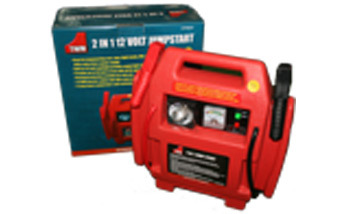 Great for jumpstarting cars, vans, light trucks, RVs, boats, snowmobiles; miles away from a power supply.